Our solutions for industry customers. For over 50 years, automotive manufacturers have come to us for our expertise in developing plastic body and accessory elements. Today, our customer base includes world-famous brands such as Volkswagen, Mercedes-Benz and MINI. By tailoring our styles precisely to the design language of the vehicle and optimising our processes, we can ensure that we produce high-quality, functional and beautiful products for them without compromising on cost-efficiency. Recently, industrial companies from outside of the automotive sector have also started to take advantage of our decades of experience in developing products and product solutions. Regardless of the sector they come from, our promise is always the same: we will always design the best possible solution, perfectly tailored to their specific requirements. From deep draw vacuum forming to ultrasonic welding. We know all there is to know about working with plastics. In fact, developing plastic accessories has been part of our core business since the early 1970s. We started out focusing on aerodynamic add-on components before moving on to producing highly-functional roof boxes in 1988. Today our range also includes sport grilles, trims and protective films. Here at KAMEI, we use some of the most state-of-the-art technology available to manufacture our roof boxes and other plastic add-on components. We work closely with our industry customers to develop high-quality, tailor-made products. And our efficient, optimised processes enable us to start producing them quickly without excessive costs. We love automotive design. Since it was founded, KAMEI’s objective has been not only to bring greater functionality and added value to cars, but also to optimise their visual design by coordinating our products with the design language of the vehicle. 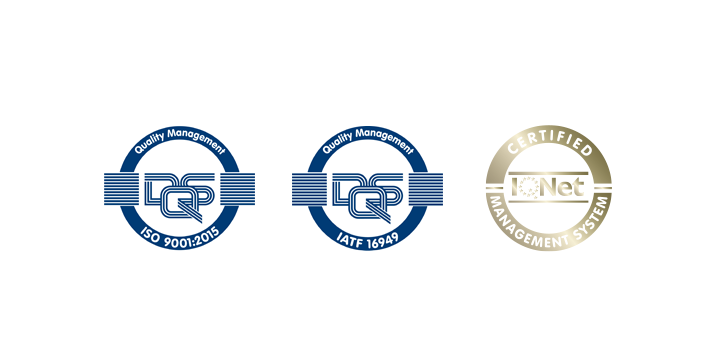 KAMEI is certified by DQS to ISO 9001:2015 and IATF 16949:2016 standards, demonstrating our ability to meet the challenging requirements of series and replacement component production in the automotive industry. But it doesn't stop there. Our quality management processes are under constant review as part of our commitment to continuously improving the services we offer. High-quality materials and excellent craftsmanship are always the focus of our manufacturing processes. These high quality standards have been rewarded year after year in the ADAC’s roof box tests and with awards from numerous automotive magazines. Need more proof? Our KAMEI roof boxes already meet the high standards of DIN 75302:2006, which is still yet to come into force. We are completely committed to providing uncompromisingly high-quality products, and our unique six year guarantee, the only one in the automotive accessory market, is testament to this. Greater flexibility, greater mobility. Developing and manufacturing roof boxes and roof racks are two of KAMEI’s core businesses. Every roof box has an optimised, aerodynamic design that largely eliminates unpleasant wind noises when driving. And each box is perfectly coordinated with the design of the vehicle it is made for. KAMEI’s exclusive ClickFix is the world’s fastest mounting system, and our DuoLift system allows boxes to be opened easily from either side. KAMEI manufactures plastic body components that add a unique and sporty touch to vehicles while also coordinating perfectly with the manufacturer’s existing design. KAMEI’s centre armrests are a real source of added comfort for many drivers. These retrofit products are perfectly tailored to the specific requirements of the OEM and meet the strictest safety and functionality standards. We work on behalf of some of the world’s most famous automotive manufactures to produce innovative and tailored accessory solutions, precisely coordinated with the individual vehicle. We have compiled a selection of our references for you here. Roof boxes and body components. Always a Volkswagen original. Always by KAMEI. KAMEI has been making exclusive roof boxes coordinated with Volkswagen Accessories’ designs since 2009. The central component of our partnership has always been the development of exclusive roof box designs that blend in seamlessly with the style and functionality of the Volkswagen models. This creates a consistent design language between the vehicle and roof box. Detailed ideas with regard to formats and colours are discussed closely with Volkswagen before going into production. Dynamism. Taken one step further. Volkswagen Accessories has also commissioned KAMEI to manufacture plastic body components for a number of Volkswagen models. We recently developed an underbody guard for the latest Tiguan that gives the vehicle an even more striking and powerful look. And our exclusive bumper trims add a sporty, off-road touch to the Amarok and Touareg SUVs. All of our body components are manufactured according to Volkswagen’s specific design guidelines, helped by our expertise in plastic deep draw vacuum forming. KAMEI has also developed a mounting system that enables the components to be installed easily by the Volkswagen dealers and factories. This means greater cost-efficiency for manufacturing. Since 2004, KAMEI has been producing a range of roof box models for Mercedes-Benz Accessories GmbH, each one tailored to coordinate with the unmistakeable Mercedes-Benz design. The high-quality roof boxes are sold all around the world by the Stuttgart-based manufacturer’s dealers. KAMEI works closely with Mercedes-Benz to develop unmistakeable roof box designs. The unique Mercedes-Benz style helps these roof boxes to blend in seamlessly with the vehicles, while the use of tried and tested KAMEI technology ensures cost-efficient production. Manufacturing, packaging and shipping are included in our services. KAMEI has also developed a special tool specifically for manufacturing the Mercedes-Benz roof boxes. Comfortable to use. Efficient to manufacture. In 2006, KAMEI developed an optimised retrofit solution for MINI drivers wanting to install a centre armrest in their vehicles. The existing KAMEI product was adapted to suit the specific requirements of the MINI models. During the development, we focused on both the high safety and functionality requirements, and on creating a simple mounting system to make it easy for MINI dealers to install them without having to drill any additional holes. Adapting an existing KAMEI accessory helped to reduce tool costs. The centre armrest is a successful part of MINI’s accessory range to this day. Recently, industrial companies from outside of the automotive sector have also started to take advantage of our decades of experience in developing products and product solutions.